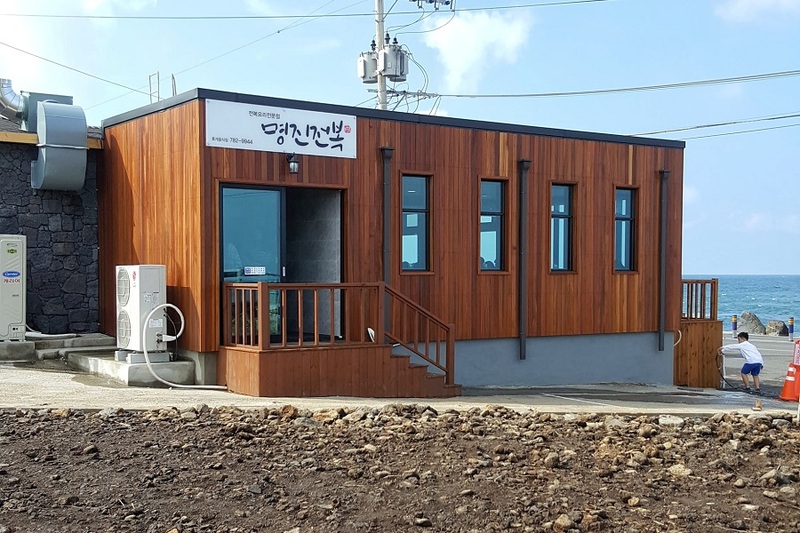 [Jeju, South Korea] If it is your first time on Jeju Island, I am sure you have heard from many whom have visited to must, MUST try their abalone porridge. Wah, using fresh abalone to cook porridge is such a luxury. 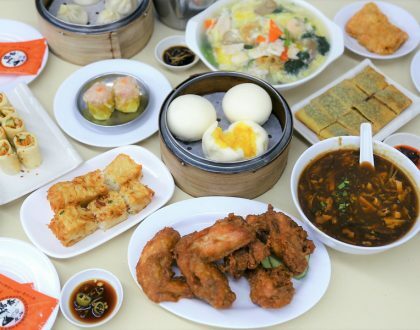 For the Chinese Singaporeans, we only get to eat canned abalone during Chinese New Year – during good years. 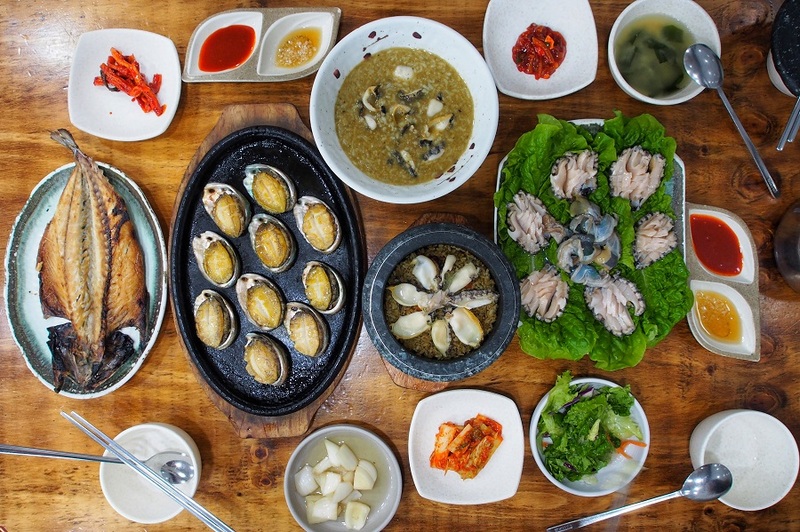 Located on the eastern side of Jeju Island, Myeong Jin Jeon Bok is probably the most well-known eatery to serve not just only abalone porridge, but an abalone feast. 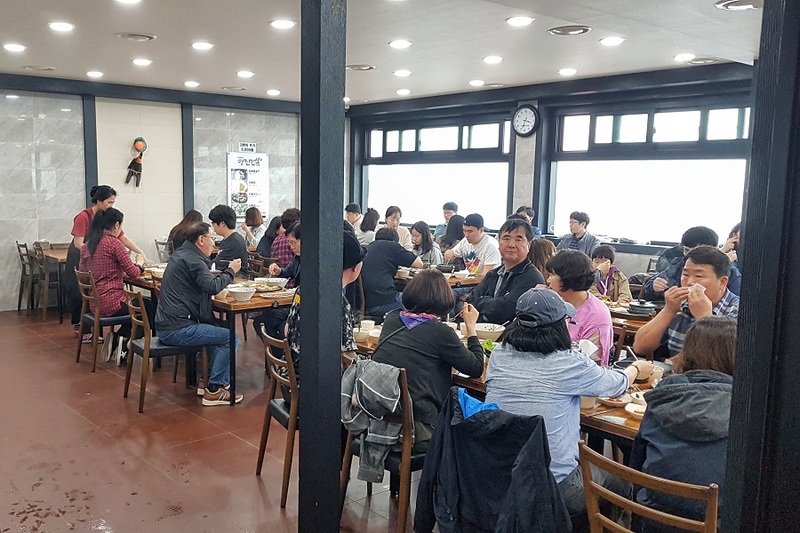 Not only it is popular among Koreans, it has also become the mandatory eatery for tourists to experience dining like a local. Hence, do expect waiting time of up to an hour. Here’s how the queue system works: Go to the counter ahjumma and she will hand you a small yellow slip which you have to indicate your order with your phone number. 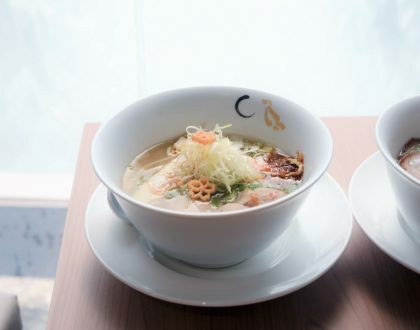 Meanwhile, there is a waiting room next to the shop, or you can simply roam around the area to enjoy the sun and sea breeze along the coastal road. The menu with straight forward with only 4 choices – Abalone Porridge, Abalone Stone Pot Rice, Grilled Abalones & Sliced Raw Abalones. 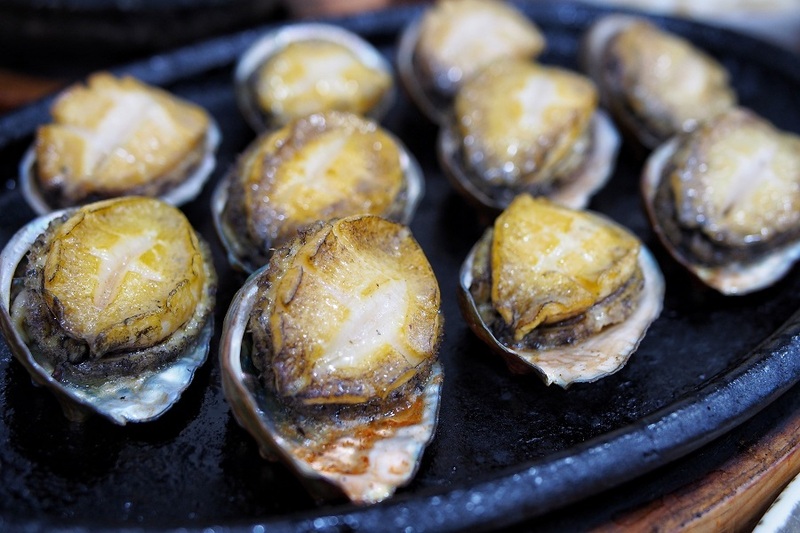 My favourite dish would be their Grilled Abalones (KRW 30,000, SGD37.50) served on a hot plate. 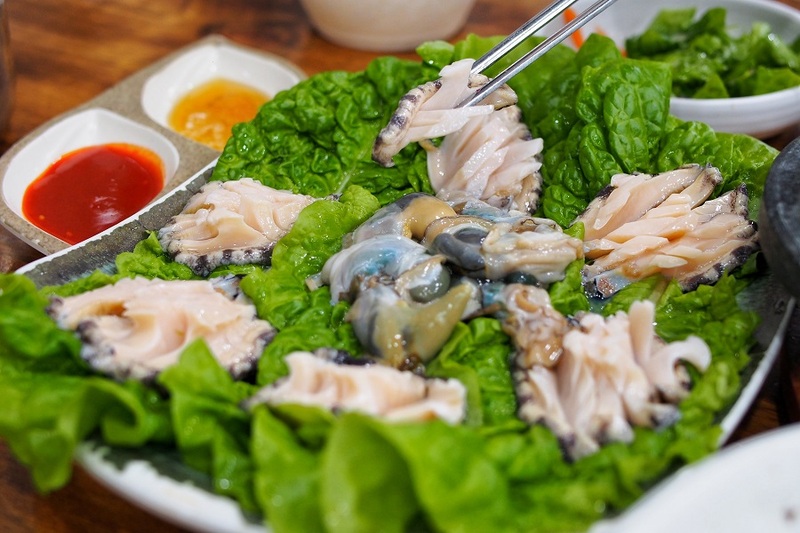 For that price, you would get 500g of round, plump abalones grilled till chewy soft. 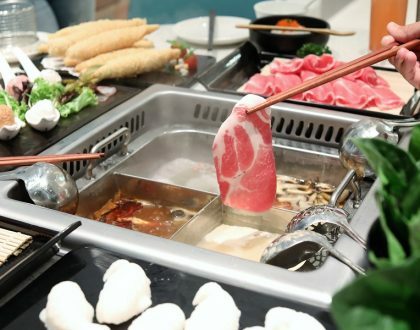 The hint of smokiness further enhanced its natural freshness. 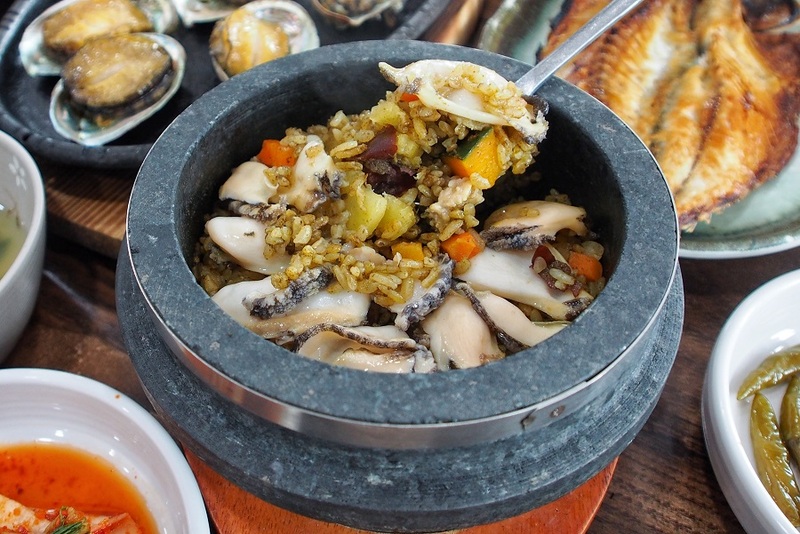 The Abalone Stone Pot Rice (KRW 15,000, SGD18.75) was also the most commonly ordered dish on every table. Using pumpkin rice as base, the fresh abalones were sliced and layered on top of the rice and sent for cooking. Initially, I felt that the rice was a little dry and lacking in flavour. I was then enlightened after observing neighbouring tables poured water into the stone pot and allowed it to further sizzle for a while. The rice turned out moister, and soaked with an immense amount of charred fragrance. 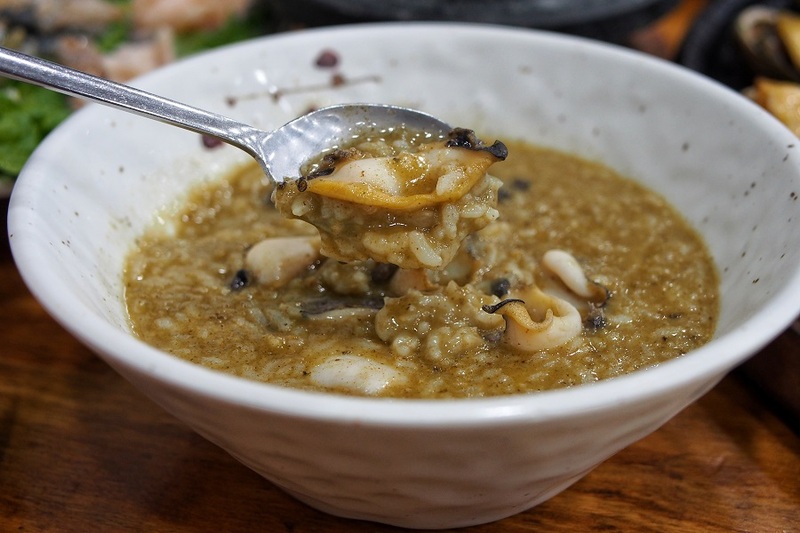 While Abalone Porridge (KRW 12,000, SGD15) was rated as one of the “must-eat” food in Jeju, it fell slightly short of my expectation. Perhaps I am not too used to seeing my porridge brown, I also found it slightly bland for my heavy taste buds that I had to mix in some salt and sesame oil for seasoning. 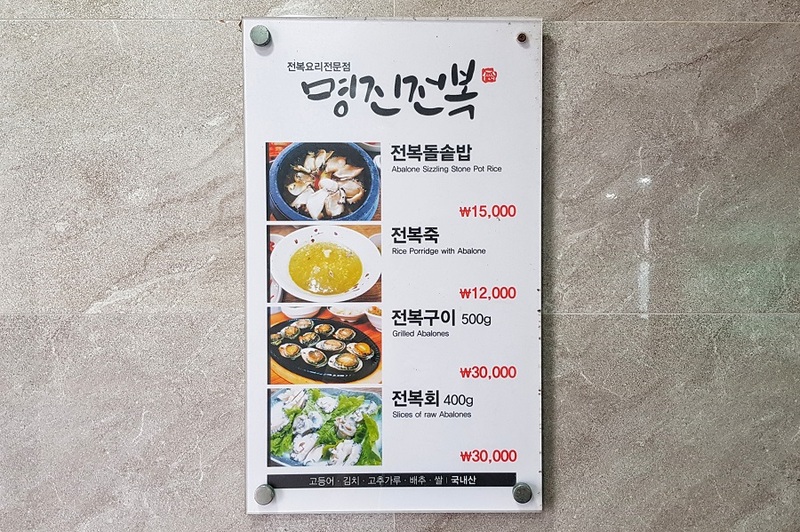 I also attempted the Sliced Raw Abalones (KRW 30,000, SGD37.50) out of curiously on how abalone sashimi would taste like. It was hard, tough and overly crunchy that I had a hard time chewing on the sliced raw abalones. Definitely not what I had expected. The sliced raw abalones also came with a portion of their innards. Not very sure if it was meant to be eaten and I wasn’t too adventurous to try it. 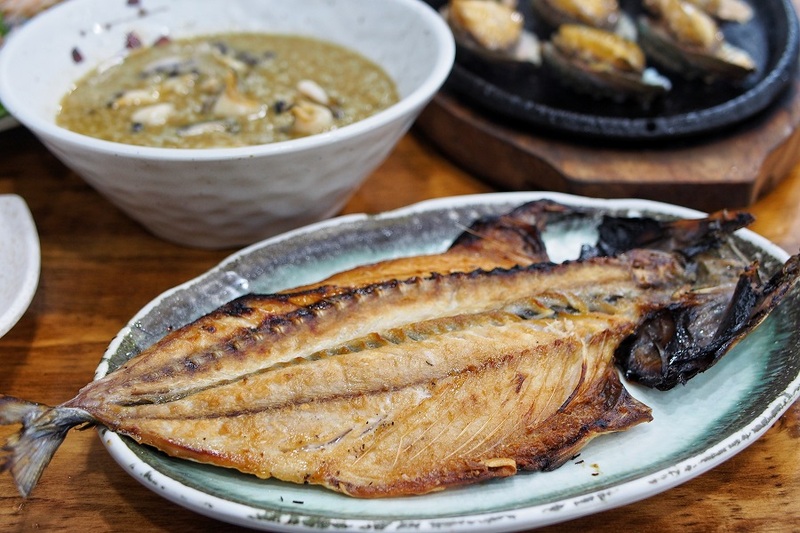 By the way, they also served a serving of Grilled Mackerel as part of their ban chan (side dish) which tasted extremely fresh with tender juicy meat and exterior grilled till golden crisp. The meal was very much value-for-money. Hi there! 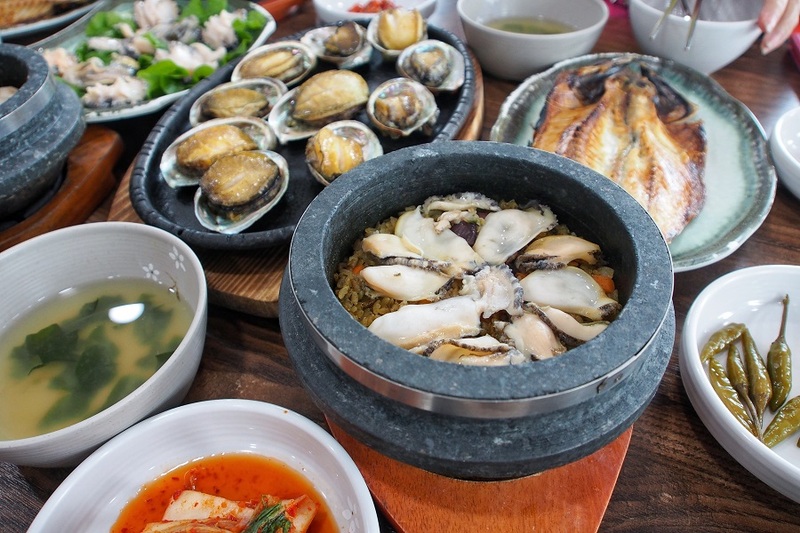 can you share the name of the abalone restaurant that you went to near Myeongjin? Thanks! Hi sorry! please ignore the comment, accidentally post on the wrong page.. Sorry!